If you’re tired of swapping batteries or recharging your mouse, we have the perfect solution. 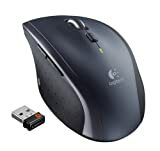 Logitech Wireless Marathon Mouse M705 looks pretty much like any basic wireless mouse out there. It doesn’t include any crazy design features or Earth-shattering functionality that you won’t find on comparable mice. What it does have, however, is insanely long battery life. In fact, it lasts for a ridiculous 3 full years on two AA batteries! Note that to get the lowest price of $29.99, you’ll need to dip into the “other sellers” section. Otherwise you can pay an extra $5 or $6 to get Prime shipping.